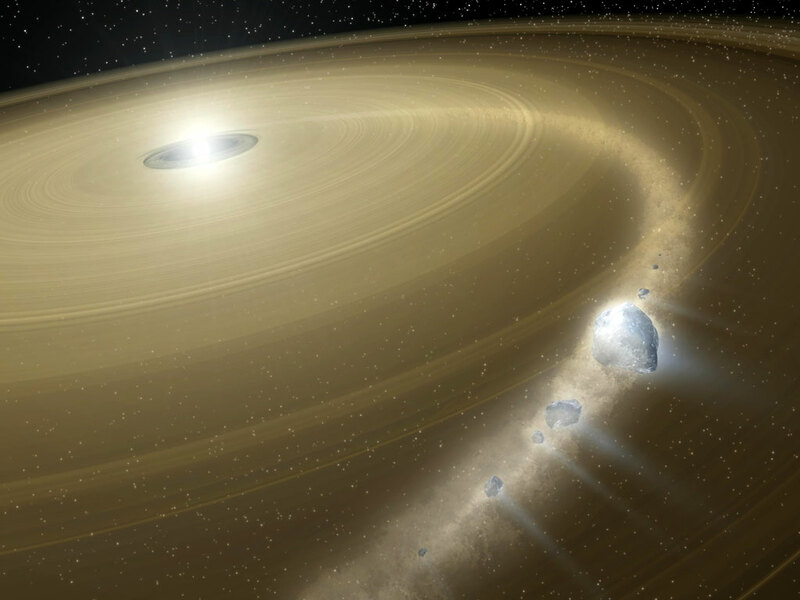 What happens when an asteroid and a white dwarf (WD) meet? I won’t try to charm you with a cute little metaphor about it being mealtime for the WD (truth be told, I’ve rather lost my taste for that particular metaphor after it recently took a rather gruesome turn). That said, the scenario is not unlike what occurs when a star encounters a black hole, as we have discussed in many previous astrobites — most recently Justin’s post yesterday. And why should black holes get all the glory? WDs, too, have enough gravitational pull to tear apart a small astronomical body via tidal forces, effectively shredding it. So it’s only logical that the authors of this paper have looked to this option to explain the dusty disks we sometimes observe around WDs. More than 20 WDs have been observed to be surrounded by dusty accretion disks. The source of this accretion material is commonly attributed to asteroids, since the composition of metal-polluted WDs is consistent with the accretion from asteroids, but not with accretion from the interstellar medium. Even the estimated mass of accretion disks observed around WDs is similar to the mass of a ~5km asteroid, supporting the theory that the dusty accretion disks are formed by the tidal disruption of an asteroid passing too close to the WD. But the disruption of the asteroid and the initial flare of accretion onto the WD would theoretically release a lot of energy in a transient outburst. Today’s paper sets out to answer a simple question: what should this outburst look like? If it’s something we can expect to be able to observe, this would provide a means of testing this model of dusty WD accretion disks. The authors suppose that an asteroid gets close enough to a WD that it is tidally disrupted, getting torn apart such that half the mass escapes and the other half becomes bound and forms a disk around the WD (see this astrobite for an explanation of tidal disruption and a great simulation illustrating the process). Since the WD is quite hot, the interior of the disk is essentially evaporated on a short time scale, turning it into a gaseous disk close in. The viscosity in this portion of the disk is large enough to allow for rapid accretion onto the WD, resulting in a transient outburst. The authors find that this transient outburst would last roughly a month, with a total luminosity of ~0.02 L☉. These numbers are of course dependent on the size of the asteroid and how closely it approaches the WD, but for typical values of these parameters (radius of asteroid = 100km, approach distance = 0.1 R☉), this luminosity is well within observational limits — we should be able to detect this outburst. The authors point out a slight wrinkle, however: according to their calculations, this outburst would look very similar to a dwarf nova. Dwarf novae (DNe) are outbursts that occur in binary systems where a WD accretes mass from a disk that is fueled by the secondary star. 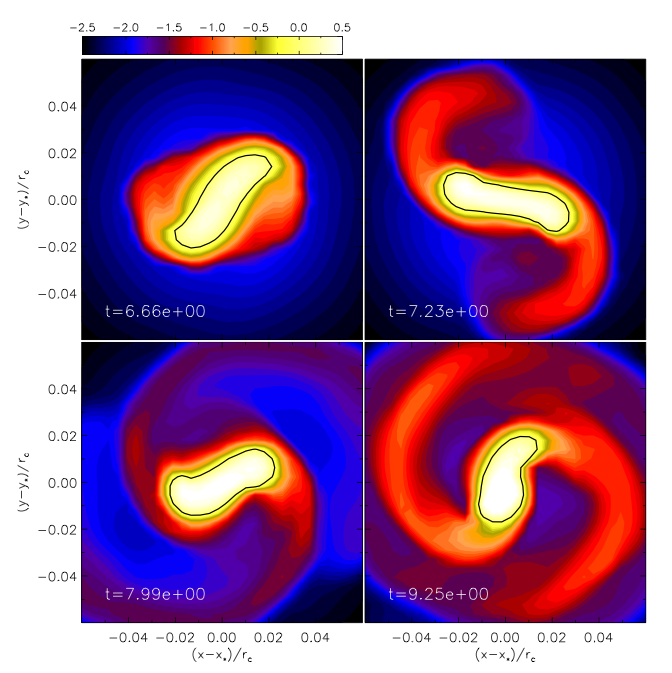 Occasional accretion disk instabilities result in enhanced mass accretion onto the WD, appearing as a sudden outburst. The authors point out that DNe and asteroid-destruction flares would have many similar observational features, such as their peak visible and X-ray luminosities, the sizes of the accretion disks, and the accretion rates. There are, however, means of distinguishing between these events. The two main differences found by the authors are 1) the WD is likely to be much hotter and more luminous in DNe than it is in transient outburst events, and 2) there should be a difference in the spectral lines detectable in transient outbursts vs. DNe, due to the difference in composition between asteroids and the secondary stars found in DNe systems. Overall, it looks like the flare from the tidal disruption of an asteroid is absolutely detectable — and all the more likely to be observed with the many large surveys that are being conducted today (for instance, the paper mentions the Large Synoptic Survey Telescope). If WD debris disks are indeed caused by destruction of too-close asteroids, then the transient outburst modeled in this paper is exactly what we can search for to prove this theory.